continue to approach, stepwise, the redshift of the parent galaxy. A recently published study adds one more layer of supporting evidence for Astronomer Halton Arp's model of Quasars ejection along the axis of parent galaxies. The discovered association can only come as another surprise to theorists of the Big Bang. 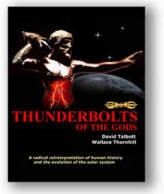 We have dedicated many TPODs to highlight the works and ideas of one of the leading opponents of the Big Bang (BB) theory. Halton “Chip” Arp found evidence in the 1960s that has a critical impact on the most fundamental assumption underlying BB theory. The redshift of spectral lines from galaxies has been interpreted as the consequence of velocity of recession from us almost since it was first measured and against warnings of the discoverer, Sir Edwin Hubble. It is the main reason most astronomers believe we live in an expanding Universe. This assumption, together with its corollary that velocity of recession is a measure of distance, has become the cornerstone of Big Bang cosmology. So when Arp first showed evidence of a physical connection between objects with different redshifts, that is, evidence for non-cosmological redshifts, he was shunned by mainstream astronomy. Over the years, several lines of evidence were found that question the assumption that redshift equals distance. Arp and his colleagues amassed a large catalogue of systems that show physical associations between objects of differing redshifts. These associations indicated that quasar pairs often are ejected in opposite directions from the nuclei of active galaxies. Tifft, Burbidge, and Bell (among others) found evidence of periodicities in the values of redshift, and both Arp and Russell showed evidence of intrinsic redshift in spiral galaxies. The overdensity of quasars or quasi-stellar objects (QSOs) around nearby galaxies has long been known and is currently assumed to be the result of gravitational lensing of highly redshifted QSOs. 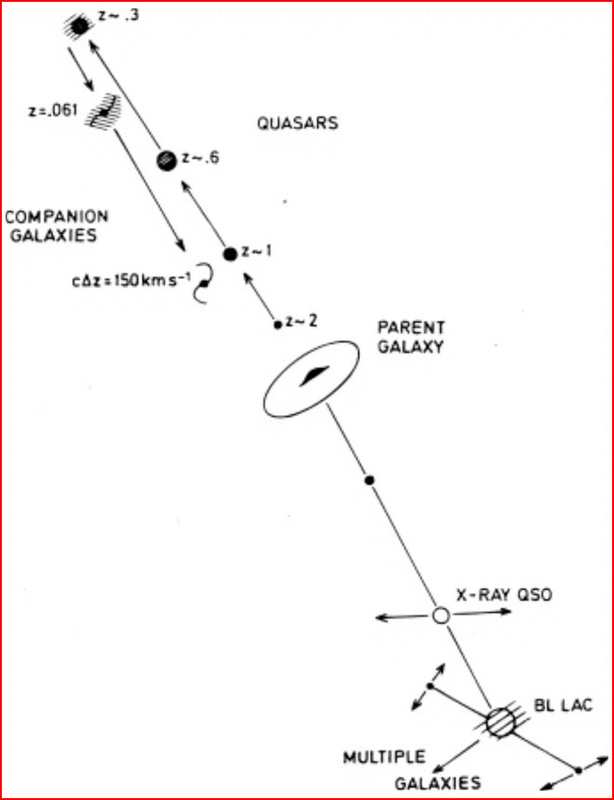 Halton Arp proposed a different model that assumes QSOs to be ejected from the active nucleus of their parent galaxy. The redshift of the ejected QSO would then be an indication of it’s age since ejection, the higher the redshift the younger the object. As seen in the above illustration, quasars are ejected from their parent galaxy and will evolve into mature galaxies over time. Arp’s model is based on observations of active (Seyfert) galaxies that show pairing of identically redshifted quasars predominantly along the minor (rotation) axis of these galaxies. In a recent paper by astronomers Lopéz-Corredoira and Gutiérrez (astro-ph/0609514), a statistical investigation was performed to test if there are overdensities of QSOs along the minor axis (rotation axis) of nearby galaxies, as predicted by Arp’s model. To this end, the authors selected 71 nearby edge-on spiral galaxies that were sufficiently well-studied and compared the positions of QSOs from a large database. The edge-on constraint was necessary to ensure a clear direction of the rotation axis. Indeed, the authors found an overdensity towards the minor axis. Depending on the magnitude of the quasars, the overdensity was found to be between 13% and 38%, with a statistical significance of 3.9 sigma (chance of this finding being a fluke is roughly 1 in 10,000). While the authors are cautiously describing this result as “tentative”, it is the first time that a statistical relation was found in support of Arp’s ejection model. This supporting evidence is not final proof, but it is a step in the right direction. Ultimately, the best evidence of ejection would be the measurement of proper motion of highly redshifted quasar pairs away from the parent galaxy. Unfortunately, current technological achievements do not yet allow for such precise measurements, but it will not be long. We will keep you posted.